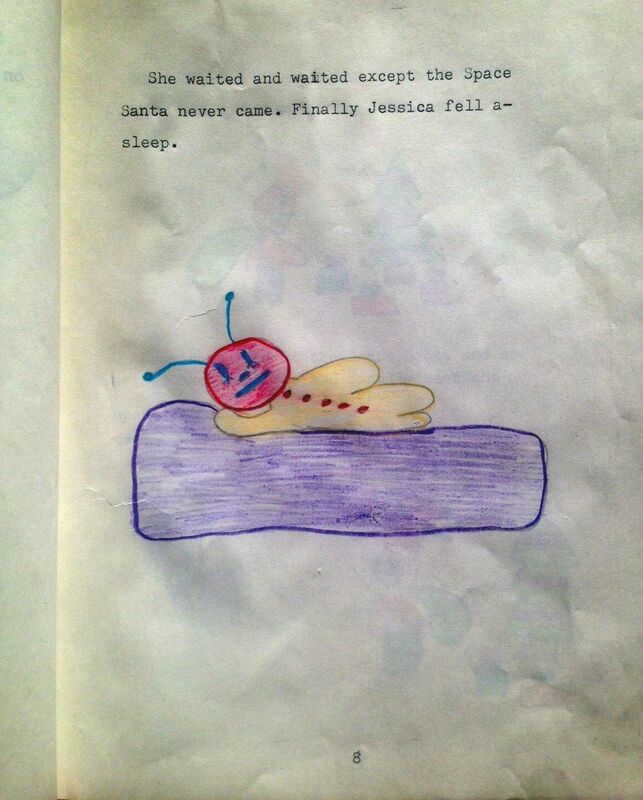 I guess my logic was that because of the warmth of Mars, inhabitants like Jessica didn't require blankets. The onesie was enough. Well lookah thar! Space Santa is revealed to our protagonist after all. The End. Not sure what to make of the scratched out grade, the initial 33/40 changed to a 36/40. Red to black ink. B bumped to an A. My mom was trying to remember which teacher this was back in 1983--everyone knows everyone in my home town-- because both my parents were teachers, my dad a principal for much of his career, so we wondered if this English teacher thought it might be a career limiting move to give the principal's daughter a low grade on the story, but my dad wasn't the principal of the school at that time so unless someone comes forward with a confession about the three point upgrade, it will remain a mystery. Tibb's Eve is here again, and with it this year, comes the final chapter of A Christmas on Mars. Look at our Martion girl Jessica who went to bed in her gold onesie, rich yet sad...but ho ho ho! Much to her surprise, she woke just in the nick of time to have an important life-changing experience. Be sure to scroll down to see the final grade I got on the story. Please post a comment if you agree or disagree. I would love to know your thoughts on my teacher's indecision. I'm cranking out this post while listening to CBC Radio 2 Morning on the headphones in my husband's office because my mom is still sleeping on the couch in the living room where I normally write. The wiser thing would have been to write this in advance, but, well, I didn't think it all the way through. As with most writing, and in the spirit of some excellent George Saunders consult, if it (a story, or in this case, a blog post) surprises you (the author) it will also be a surprise for the reader. George has said: "Don't be afraid to be confused. Try to stay permanently confused." I take comfort in the notion--in both life and writing--as I spend a fair amount time confused and surprised. Cheers to that George, and thank you. For those who haven't looked up Tibb's Eve on Wikipedia like I did (also Tip's Eve or Tipsy Eve. Or Tweebles or Tweed's as my neighbour has been calling it), it's an excuse to get together with friends for a drink on the first night of Advent. It would seem, to me, to make more sense, if it was the last day of Advent to start drinking with friends, which this year is tomorrow, December 24th, when we are already going to the in-laws for Christmas Eve dinner, so everything is going to happen on the same day. So tonight it is. Besides, it's not like we need reason to have a drink with friends but leave it to the Southern Newfounlanders to make one up. And thanks again again to Tom Power and Talia Shlanger for putting on a great morning radio show. Also, for a little more George Saunders wisdom, while I try to finish this post that keeps getting longer, I came across this lovely, 7 minute short film, George Saunders: On Story from the Story Is a State of Mind Facebook group. The film is full of juicy Saundersesque nuggets like, "It's your own discontent with it [a story] that in some slow mysterious way urges to higher ground, often it will do so in ways that surprise you." I could say the same about this post. And what a year of surprises it's been. Arsenal Pulp Press decided to publish my book (and I've finally come clean about Moving Parts being my second book now with A Christmas on Mars out in the open), we snuck cousin Mike into the family golf tournament and cousin Harvey's birthday party, my nephew Adam ran off and got married in Vegas, and today we're going to see the matinee of Phantom of the Opera--a surprise for my mom who is probably now awake on the couch and I should go an make her some coffee and let her know we're heading out to "explore" King Street later today. So if you know her, or see her, please don't tell her. I want it to be a surprise. May your holiday be filled with surprise and confusion, and in the words of George Saunders, "...go out in the world and see what it is…come back in befuddled, then try [to write it]. Do something beautiful."